Anhui is China’s poorest province, providing a large percentage of China’s domestic helpers. At the same time, Anhui’s slow pace of modernization has kept it beautiful and its environment cleaner than in other areas of China. 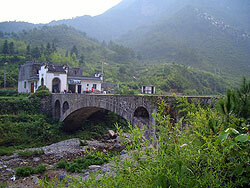 Anhui has a dramatic and alluring landscape. It sits at the intersection between north and south China, athwart the basins of the Huai and Yangtze Rivers. Due to frequent flooding of its lower plains, most people have gravitated towards the northern areas of the province, particularly the hilly areas of Jiang-huai and other locations north of the Huai Plain. Huangshan Mountain’s imposing granite formations and mist-wrapped landscapes are known world-wide, the perfect setting for the nearby Buddhist Jiǔhuá Shān, a holy place of pilgrimage. Anhui’s sites are so beautiful that it attracted the attention of UNESCO in 1990, which put five Anhui locations on its list of “World Natural and Cultural Heritage” sites. The unique architecture found in Yīxiàn and Shèxiàn and picturesque Huīzhōu villages complete the Anhui experience. Anhui has four seasons, but it is generally moist in its mountainous areas and dry on the plains.